Part of the fun of the Christmas season is making Christmas ornaments to decorate both your tree and home. Decorations made from paper can be surprisingly beautiful and cost-effective to create. The following slideshow features 11 paper-based ornaments and Christmas home decor to help you get inspired. Make a contemporary paper version of a Christmas village. You don't have to have an artistic bone in your body to get good results from this craft project. The paper Christmas village is particularly easy to create because it is printable. All you have to do is download, print, and cut! Crafting something spectacular doesn't get any easier! The village looks great just as it is, but you can take it to the next level by adding some electric tea lights to turn the houses into luminaries. This an excellent craft for those that want to add a homemade touch to their holiday decor but are short on time during the busy holiday season. Rustic ornaments add a "country" touch to your tree. This Christmas tree ornament has primitive charm and is easy enough for children to make. All you have to do is find some twigs, cut them to size and glue onto a strip of Kraft paper. Punch a hole in the top of the paper strip and hang. This ornament is fast, easy and very thrifty. Your children will proudly display their "crafty ornaments" on your tree. Very cute, easy and quite clever! Who says Christmas trees have to be green? Download this 3d printable Christmas tree table decor craft, and make some strikingly modern tree decorations in minutes. This project is another quick print, cut, and glue Christmas table decoration that those short on time will appreciate. 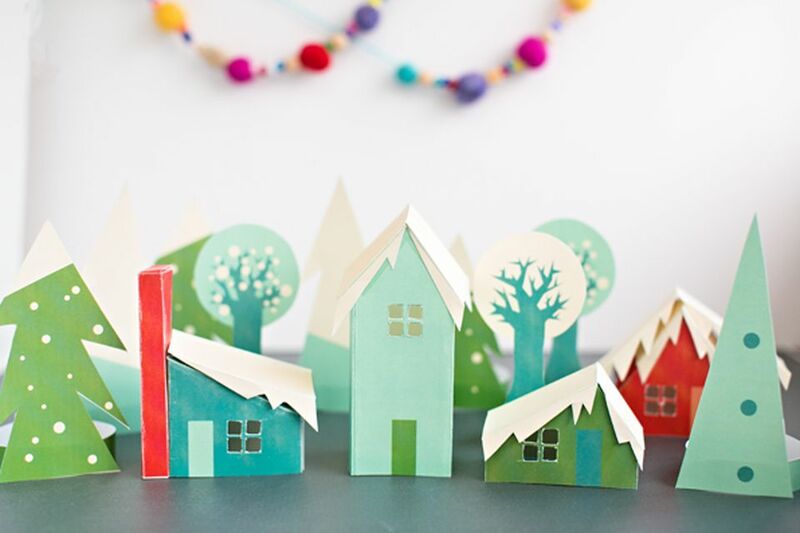 These paper trees are easy enough even for little ones. They should be able to out the trees with safety scissors and some guidance from Mom. The edges may not be perfect, but your children will certainly feel proud of the Christmas home decor they helped make. After all, isn't Christmas crafting all about making memories? This Christmas advent calendar craft project is delightful, fun and unique! Fill the small kraft paper boxes with little treasures suitable for the recipient, then embellish with red and white decorative items. Watch your children's eyes light up every day when discovering small toys or candy in the boxes. What a fun way to countdown the days until Christmas! Advanced paper crafters will love making this Christmas scene shadowbox. You'll be glad to know that everything in the scene including the frame is built from paper. The tutorial also explains how to insert a led light strip into the box frame for a subtle lighting effect. Although this shadowbox takes some time and skill to make, the results are worth it! You will have an impressive Christmas decoration that adds holiday spirit and ambiance to your home decor. Cut out the adorable paper deer and Christmas trees with the free printable templates available for download. All you need is standard 8.5" x 11" paper, scissors and a printer. Can we call this craft cheap and easy? The site also offers a video tutorial for you to follow along, making this paper art almost foolproof. You and your children will have a ton of fun making these Christmas ornaments. Decorate your tree, decorate your table, heck you can decorate your whole house! Take this Christmas paper ornament craft one step further. You can make the ornaments so that they glow in the dark! The tutorial author explains all in the video. Kids will remember the fun they had making this Christmas craft long after the holiday is over. If you are a fan of the shabby chic look, this holiday craft might just be for you! Who would have thought paper cupcake liners could look this good? The tutorial is in Italian, but the instructional photos are easy enough to follow. If you need written instructions, you could always use a language translator to guide you while making this craft. These trees, in spite of their humble origins, look like something you would find in a higher priced boutique type shop. Beautiful! Cardmakers love to give and receive handmade cards. At Christmas time many people like to display their cards as part of their Christmas decor. Instead of taping them to the wall, or hanging them from a string, show them off with this trendy reclaimed wood card holder. This project looks difficult but isn't. Just follow the steps, and you will have a cardholder that will receive many compliments from your friends. Paper snowflakes are always a lovely holiday decoration. These snowflakes are crafts that are easy on the pocketbook as well. Paper, glue, and thread are the only necessary supplies. You could hang your snowflakes from a window, or you could hang them from your tree to make it handmade lovely. A Christmas tree decorated with only white paper snowflakes and lights would add beauty and drama to any home decor. So pretty! These have got to be the cutest paper reindeer ever! You will smile every time you look at them. Toilet paper cardboard tubes have never looked this good! If you are a teacher and decide to use this craft in your classroom, you could also tie in a lesson on recycling while working on the project. Make several reindeer each representing one of Santa's herd. Santa has nine reindeer pulling his sleigh: Dasher, Dancer, Prancer, Vixen, Comet, Cupid, Donder, and Blitzen, with Rudolph leading the head of the pack. Don't forget to add a red nose to one of your reindeer to represent Rudolph in your herd! You can never have enough paper tube Santas. This tutorial is a YouTube video that is quite easy to follow. The video is a plus for those of you that are visual learners, as most crafters are. It is so much easier to follow a demonstration than trying to make sense of a list of written instructions. The video is two minutes long, and you will learn all you need to know to make these cute Santas!